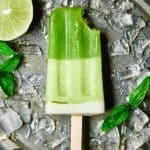 These refreshing popsicles are indeed made with honeydew, coconut and lime, but they get an extra punch of flavor from fresh mint, basil and ginger! 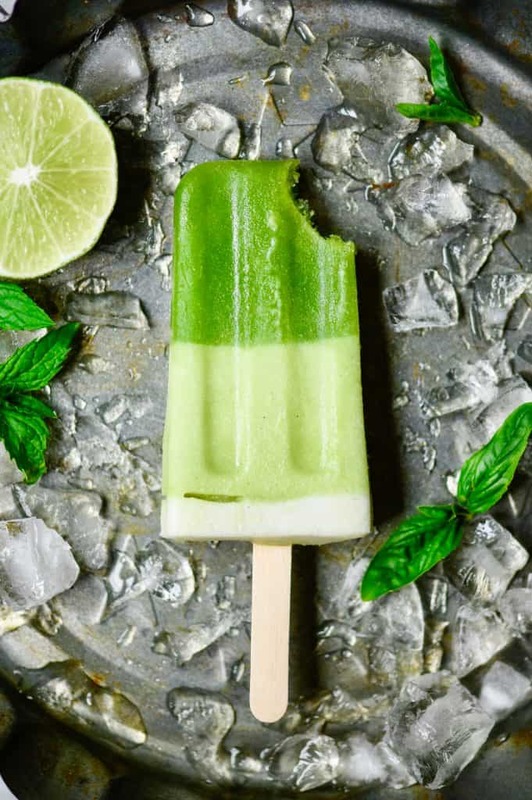 We thought Honeydew Coconut Lime Mint Basil Ginger Popsicles may have been a bit too long of a title. 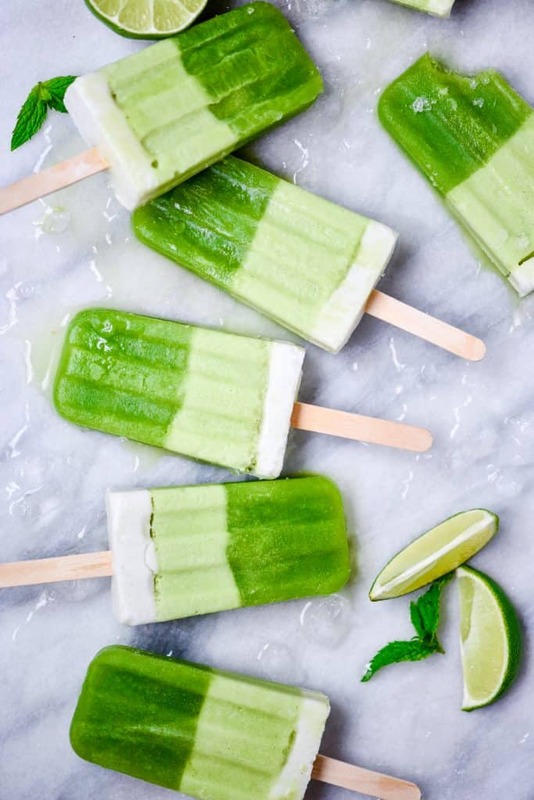 Ombré popsicles are easier than they look – the only important thing you need is a bit of extra patience to let each layer mostly freeze before adding the next. If you don’t have the time of patience (we totally understand), just combine everything into one layer. When it comes to popsicle equipment, we absolutely love these no-frills stainless steel molds from Amazon. When you’re ready to remove your popsicles, all you have to do is run each one under warm water for a second or two and it will pop right out with no trouble. We’ve even tried boozy ice pops before with success – the stainless steel cools enough to get them to the right consistency, even with the addition of alcohol (if that’s your thing ;)). These are a great mid-afternoon or post-workout snack on any hot summer day! 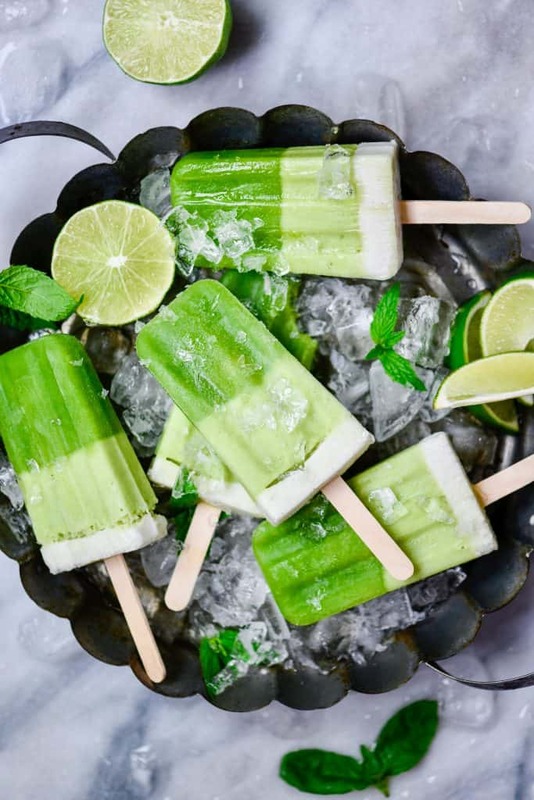 Fresh ginger, basil and lime add a punch of flavor to these honeydew coconut popsicles. Blend all ingredients in high speed blender until smooth. Divide in half, and blend one half with an additional 1 cup of coconut milk whisked with 2 tsp vanilla (for lighter green layer). Pour approx. 2 1/2 tbsp dark green layer into popsicle mold. Freeze until mostly hardened (about 30 minutes). Add additional 2 1/2 tbsp of coconut milk + green layer. Freeze until mostly hardened. If desired, add one final layer of 1/2 tbsp coconut milk/vanilla mixture. Let harden completely (4-6 hours) and enjoy! Run popsicle mold under warm water for a few seconds to easily release from mold. Stainless steel popsicle molds work especially well.